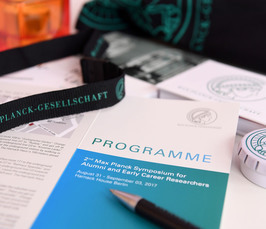 3rd Max Planck Symposium for Alumni and Early Career Researchers "Advances in Digitalization"
Following up on the successful 2nd Max Planck Symposium in 2017 focusing on "Sustainability and Social Engagement", the Harnack-Haus will once more be transformed into a "home away from home" in the course of 3rd edition with the title "Advances in Digitalization" -- with interdisciplinary talks, panel discussions and workshops. UPDATE: The Picture Slideshow is available now. Please note that the available programme is constantly updated as speakers are confirmed and workshop topics and abstracts are finalized by the attendees. We invite you to view last year&apos;s programme for reference. Keynote on "Digitalization in Transportation"
"Prepare to be unprepared - what leaders in science can learn from applied improvisation"
SAVE THE DATE: The 4th Max Planck Symposium will take place from 1st to 4th September 2019 at the Harnack House. More information to come soon.